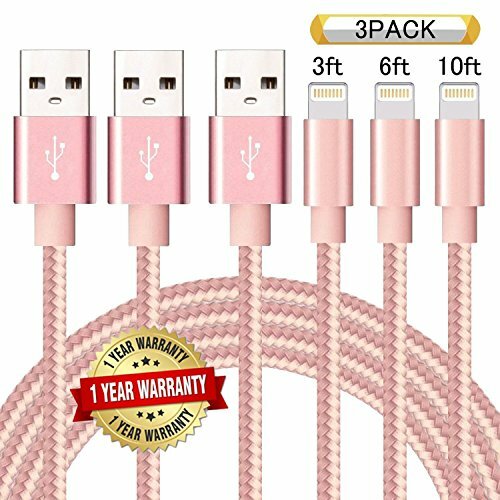 3 Pack of iPhone Cables $5.99 SHIPPED! Use code SBEIVY5P for 50% off! Final price is just $5.99 for 3 cables! PERFECT LENGTH - 3Pack 3FT 6FT 10FT meets all your demands in daily life. Such as wall chargers, car chargers, adapters, multi-port desktop USB chargers and power banks. NYLON FIBER CLOTH - The high quality nylon fiber cloth is wound tightly around the Ulimag cord to withstand day-to-day wear and tear whilst at the same time keeping it flexible and tangle-free. UNIVERSAL COMPATIBILITY - compatible with phone X, phone 8, phone 7, phone 7 Plus, phone SE, phone 6, 6 Plus, phone 6s, phone 6s Plus, phone 5, 5c, 5s, Compatible with iOS10 operating system without any error messages.